When to use: When you are bearish to very bearish on the market. In general, the more out-of-the-money (lower strike) the put option strike price, the more bearish the strategy. Loss characteristics: Loss limited to amount paid for option. Maximum loss realized if market ends above option exercise A. Decay characteristics: Position is a wasting asset. As time passes, value of position erodes toward expiration value. 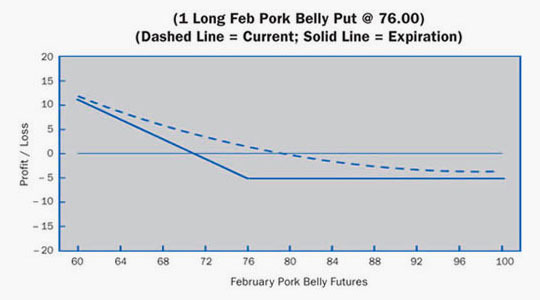 Pork Bellies have been trading at contract highs of between 75 and 85 cents per pound. The trader feels that a major decline is very likely. However, the trader is not sure when it will come. He decides to buy a long-term put option. 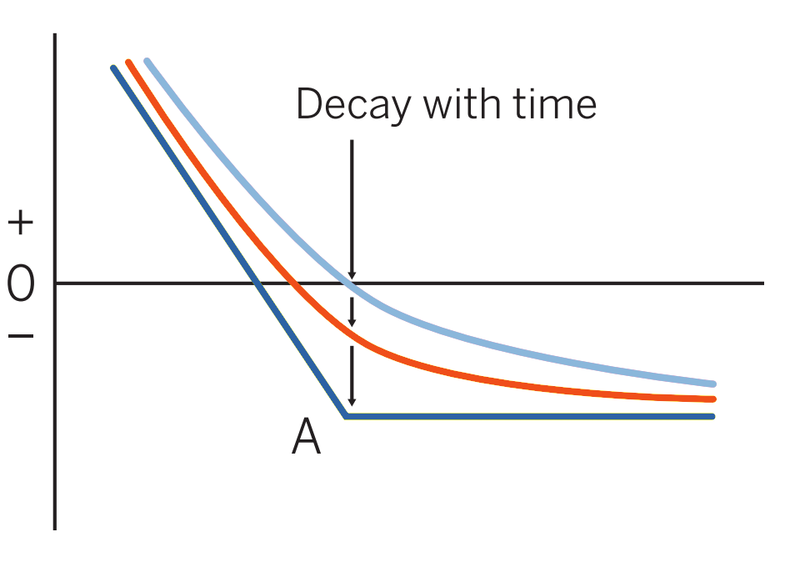 By doing this he initially has very little time decay. He can ride out a temporary upward move and still be in for the big break. Loss Risk: Limited to the premium paid. Loss above 70.90 with maximumloss of 5.10 above 76.00. Potential Gain: Unlimited, with profits increasing as the futures fall further and further past 70.90 breakeven. This trader must be very bearish, with volatility increasing, to make this trade profitable. If held to expiration, the futures would have to fall more than 10% by expiration just to break even. Check the follow-up strategies if the futures fall or volatility rises to the levels expected before expiration.